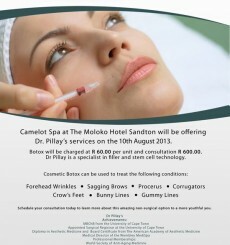 The Very Talented Dr Pillay, the director of this award winning Aesthetic Institute has just returned form Johannesburg where he offered his services and expertise at the Camelot Spa Moloko Hotel. Dr Pillay travels to Johannesburg and Durban on a monthly basis where he is available to all our Johannesburg and Durban based clients. Consultations for amazing non surgical options to a more youthful you, Dermal fillers, Cosmetic and Medical Botox to treat Forehead wrinkles, Sagging brows,Crows feet as well as conditions such as Migraines and Bruxism.